How tight are you holding on to the rules of living with diabetes? Believe it or not! 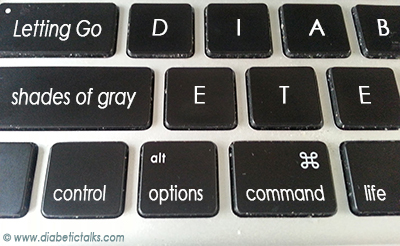 There are many shades of grays while living with diabetes. Unfortunately, many people living with diabetes feel it has to be all or nothing when it comes to good diabetes management. I talked previously about high or even low blood sugars not being bad. They are numbers that help guide what actions if any, are needed to get blood sugar levels into a healthy range. Fear can cause us to hold on too tight when it comes to managing blood sugars. I am guilty of this myself. In the past, I aspired to have complete control. If I didn’t make my numbers, I would follow with negative, punitive, self-blaming or self-degrading thoughts about how I was a failure. The reality is that I was holding on too tight. After 36 years with diabetes and working as a Certified Diabetes Educator, I can say with high certainty that perfect doesn’t exist in the world of diabetes management. I was trying to control a chronic illness. It was all or nothing. The idea is to practice diabetes self-management, not control. Trying to be perfect can cause extreme emotional turmoil. Try a humanistic view of diabetes management that is comprised of flexibility and self-soothing behavior. For example: just trying your best, accepting that humans are not perfect, and acknowledging that everyone makes mistakes from time to time, can reduce your stress and allow room for enjoying life. To live a happy life with diabetes it is necessary to accept what’s happening at the moment as well as making adjustments without self-blame. Blaming yourself for things that are out of your control is not helpful to you or those around you. Diabetes can be managed, but it cannot be controlled. You can control for some of the factors that impact blood sugars, but not all. It would take me hours to write down all the factors people tend to overlook but let’s just look at a few of them. I am sure that everyone can predict anger or sadness ahead of time. Only if! A person could give extra insulin before a layoff at work. Wait! If you were to get angry, how much insulin would be needed to compensate for the adrenaline or the cortisol when you get sad? It starts to get confusing, and the best anyone can do is be vigilant, think ahead, and monitor your blood sugar, then make adjustments as needed. Not a Dairy Queen Blizzard! You can’t know how much energy you are going to exert while digging out your car. Extra or unplanned exercise can mean low blood sugars, or overcompensating for exercising may mean high blood sugars. Diabetes management is very complicated. 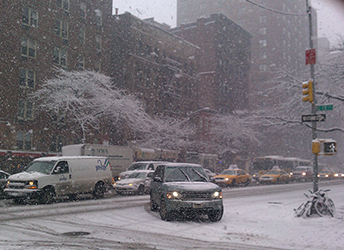 Because of the last blizzard, the trains ran faster than normal. I headed out to work not planning for the possible delayed commute this morning. This morning the subway train was not running at all. Before leaving home, I prepared for a couple of blocks walk and a short train ride. Instead, I was crammed like a sardine for 45 minutes into a bus that I had to get off earlier because it turned instead of continuing down Broadway. I then walked and was stressed out about being very late to my first therapy session of the day. All I could think about was getting to work. Instead of thinking, I needed to eat. I walked the 16 blocks before realizing my Continuous Glucose Monitor (CGM) fell off. Normally, I would have had a loud alert, instead; I had a low blood sugar reaction at the end of my journey. I realized that many things on this journey were out of my control—a blizzard, a crowded bus, strap hanging for 45 minutes, heightened anxiety, and a long walk. I took some deep breaths of air, took care of the reaction, and started my day. My CGM is still MIA, but I can live without it for a few days until the new one gets here. Things happen! It’s your choice as to how you handle it. One thing I know for sure is that I am not at fault for things beyond my control. So, I make a choice not to blame anyone especially myself. As long as I try my best, I am doing a great job managing my diabetes. Previous Article Change? Achieving Diabetes Preferred Lifestyle! Next Article Health Insurance Insanity!! !